One of the first tasks my team and I set out to accomplish when beginning work with a new client is to make sure they have five key marketing items prepared. If they are missing some or all of them, we work quickly to create them. Before any public outreach, media relations or marketing tasks can be implemented, it’s important to be prepared with materials for our audiences. 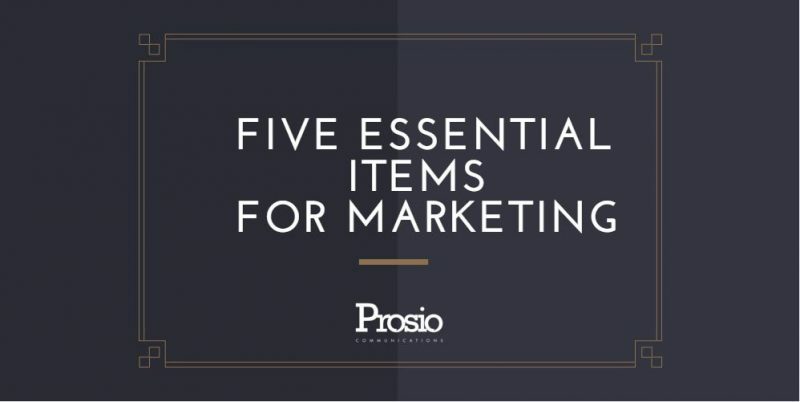 If you’re just starting your marketing efforts (or even if they’re well under way), make sure you have these items prepared for use. As soon as your business is established, its identity should be as well. Your business identity consists of your name and logo, and sometimes a tagline. Have a logo designed — a good graphic designer often can provide you with a few options for a nominal fee, though the more elaborate your logo, the more costly the development might be. Keep in mind that it should be relevant to your industry and easily recognizable. It may be an image, letters, simply the company name in a unique style or any combination of those components. What do you want it to convey about your business? What do you want people to think of first when they see it? What makes it memorable? Think about these questions and have a plan before you move forward. Your logo should be used consistently on all of the materials mentioned in this column and in all of your marketing efforts, whenever possible. The goal is for that image to be automatically associated with your company, and to establish a brand identity. You’d be surprised how often this simple yet essential item gets overlooked. There are loads of companies who can print affordable and attractive business cards for you. Make sure to include your logo, your name and your business’ name, and all contact information: mailing address, e-mail address, website, phone and fax numbers. Make sure it looks professional and that it’s legible. I can’t tell you the number of times I’ve received business cards with tiny fonts and crammed information. I almost had to pull out a magnifying glass to read them (And I have 20/10 vision, by the way). Just as important as having a business card is circulating it. Give it to everyone you meet, and have some available in your reception area. You never know when someone might need your services or be looking to refer a friend. I can tell you from personal experience that the Internet is the first place I check when I want to find out about a company. Shoe repair, landscaping, catering … I always do an online search for these services before anything else, and companies that have websites (moreover, helpful websites) are sure to get my attention. Essentially any business can and should have a website to help consumers choose them over competitors. Basic information such as services available, location(s), pricing, hours and contact information should all be easy to find. Industry-specific details might be relevant as well — perhaps a menu or company background. Keep in mind that all information should be useful and relevant to your target audience. Don’t limit your online presence to your website, however. Consider branching out and using social media websites such as Face­book and Twitter. These allow for unique opportunities to interact with the public and maintain constant relationships. Look into discount websites such as Groupon and see if they make sense for your company. If you have great reviews on sites such as Yelp, take advantage of that and link your website to the reviews. Allow all social media and online elements to work together and complement each other. Mention these pages on all written information, from your business card to your brochure. I always emphasize the importance of having a media kit prepared before any media relations efforts. Even if you’re not planning any, you don’t want to be rushing to assemble one if the opportunity for press coverage arises. It’s the best PR there is! A media kit should contain basic information about your business, such as a fact sheet or brochure, any previous news coverage and news releases, and your business card or a sheet that provides contacts that might be needed — perhaps your marketing person or investor relations contact. Have several copies of this folder available for any journalist or potential investor who needs details about your company. This last category is where it gets fuzzy. Every industry and company is different, so you’ll have to determine what type of items work best for you. Take-away items include pieces such as brochures, tip cards or info sheets. It’s something your customers keep for details about your business. A restaurant would have a take-out menu. A car dealership might have a promotional card with contact information. A dry cleaner might have a magnet or coupon. It should be readily displayed in your place of business and something that customers will pick up for further information. It should have your contact information and details about the goods or services you provide. Don’t forget to include any promotions you are currently running or information about upcoming events. With all marketing items, my No. 1 rule is quality control. There’s nothing that can eradicate credibility faster than a spelling or punctuation error. Have your materials proofread multiple times. You might even consider having them professionally written and designed so they’re as polished and reputable as possible. Take a moment to evaluate your marketing techniques and make sure these five key items are on hand and ready to be used at a moment’s notice. They are the foundation for a successful public relations effort, so review your materials and update them as appropriate. This article originally appeared in the January 21, 2011 edition of the Sacramento Business Journal.